Commute Smart Week runs until November 14th, but what is it and who is behind it? There has been a lot of media coverage about commuting recently so far as the length in terms of distance and time taken to get between home and work. A report was published by The TUC to coincide with ‘Commute Smart Week’ which runs in the second week in November. This the launch of Workwise UK’s annual, winter long campaign designed to increase the awareness of how to implement smarter ways of commuting in the winter. What will commuters be considering from now to the end of March? Disruption caused by fog, floods, ice, snow and leaves on the line will rank highly as to these factors will delay trains, trams and roads. They also should be considering political meddling in the UK’s transport system and with the announcement that Transport will see a 30% cut in its budget, rail delays will surely be a by-product as Network Rail’s cash is squeezed by the Department for Transport (DfT). The campaigners are seeking to inform commuters and crucially employers as to how they can change their work styles and patterns. For example, can commuters work flexibly to avoid travel disruption so that the traditional working hours are changed. This brings the chance to travel on less crowded trains, tubes, trams and buses and also to miss early morning rail disruption caused by ice and snow. If the weather looks as though it could disrupt rail travel, prepare for disruption or work from homes. Avoid travelling by road on a Friday afternoon as statistically there are more accidents at this time than any other time and that there is an increase of 20% in traffic accidents in the winter. UK rail of course is the safest rail network in Europe, if not the world so this is an important thing to remember. The TUC has published a report into our commuting habits and it confirms what millions already know! That commuters are spending longer and longer travelling to and from work covering greater distances than before. In fact those spending over two hours travelling daily has increased by 72% in the last decade to 3 million last year. There are also an estimated 880,000 commuters travelling for three or more hours a day. Women commuters have made much of the increase up with a 90% per cent rise travelling over two hours a day and a massive 131% per cent increase in those travelling three hours or more since 2004. Unsurprisingly, the biggest increases in lengthy commuting took place in the South East (+103%) and the South West (+102%), while the East Midlands increased by 87% and Wales by 76%. 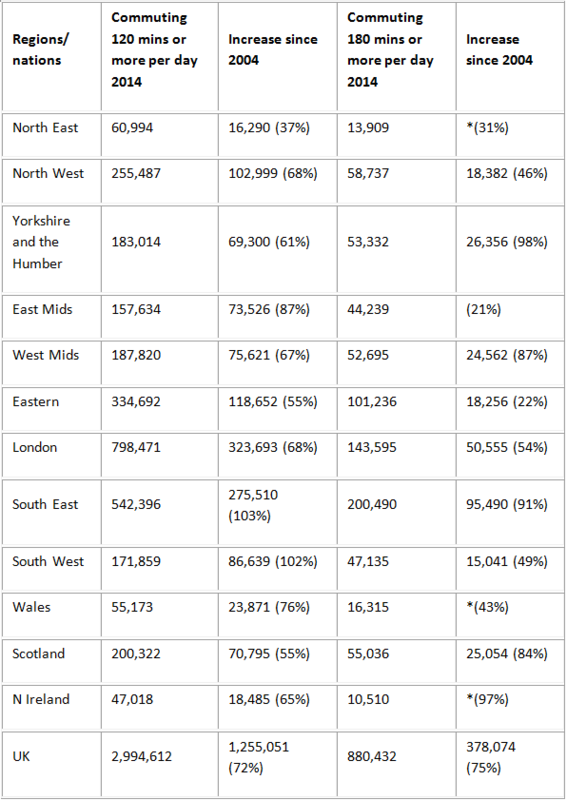 For those that travel for three hours or more a day, the biggest rises were in Yorkshire and the Humber (98%), the South East (91%) and the West Midlands (87%). This probably reflects the extra train services operating when compared to a decade ago and that many of them are longer with a massive investment in new carriages and longer platforms. New stations have also opened and this combined with soaring motoring and property costs in urban areas has made rail commuting the lesser of all evils! Season ticket to property ownership? Season tickets are often quoted as being very expensive, which they can be at as a headline price. But, if you can afford an annual ticket, you are charged for 40 weeks a year and broken down to a daily rate, can often be less than driving costs. And of course, many commuters can now work on trains especially as on-train-wi-fi becomes more common. And for those who can work flexibly, then cheap fares can be booked in advance. Longer distance commuting can also allow commuters to get on the property ladder as prices reduce away from urban areas. An example of this is that Chiltern Railways’ upgrade of the Marylebone to Birmingham line has brought a boom to Bicester and Banbury so London and Birmingham are equally commutable from these areas. The same is true of Milton Keynes and Northampton, as with the Chiltern route, many more services operate than 10 years ago and at far higher speeds. Many commuter services are now in air conditioned 100mph trains with wi-fi make travelling more bearable than driving. The TUC report suggests that longer distance commuters reduces ‘life satisfaction’ but increases your wealth with above average earnings. Average UK commuting time is approaching an hour a day and has increased the TUC thinks because the recession meant people had to look further afield for work or affordable housing. The TUC also say that there has been a lack of investment in roads and railways leading to creaking infrastructure that mean that in some cases the same journey is taking longer now than it used to. So far as the railways are concerned they are wrong. However the DfT and Network Rail has managed the massive investment (or not) in the railways, this is a disingenuous statement to come out with. There are more and newer trains and services operating and as any passenger will know, things have got a lot better on our railways. There is room for improvement but there always will be.